What is Algae and What Can You Do About It! What is Algae & What Can You Do About It! Another Enemy to your driveway creeps in during the hot-rainy season. This creepy crawler is ALGAE! Fungus. It can be black, green and mossing. Algae can start to creep in where areas of high levels of humidity and heavy rainfall occurs. 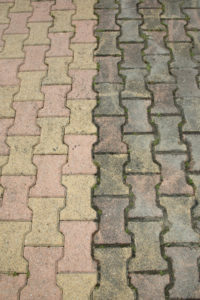 Although it doesn’t do permanent damage to your driveway, it is a big eye sore. If you don’t get rid of it early, it will start taking over your driveway. Do not allow this to happen. Loosen by scrubbing the algae that is on the cement. You can either use a push broom with small strokes and pressure. You want to be able to break the algae’s outer shell so it can absorb bleach. Detergent solution: Fill a bucket with a gallon of room temperature water. Add 1 quart of bleach with 1/4 cup of TSP powder or strong detergent. Mix this solution together as you break up the algae in the different areas on your driveway. Pour the solution in the affected areas as you try not to affect nearby plants. Let it sit there for at least 20 minutes as you scrub the area even further with a broom. Rinse down the solution with your hose. Avoiding any plant areas. Repeat the steps if it is necessary. Sometimes we just don’t have the time, but you have your neighborhood brothers who are your Algae Removal Annapolis Maryland crew to get the job done with one shot. With the equipment you don’t have, they can make sure your driveway stays fresh all year around. However, there are some things you can do once a year. Check out the next tips on 7 Things to do for an Exterior Spring Cleaning.